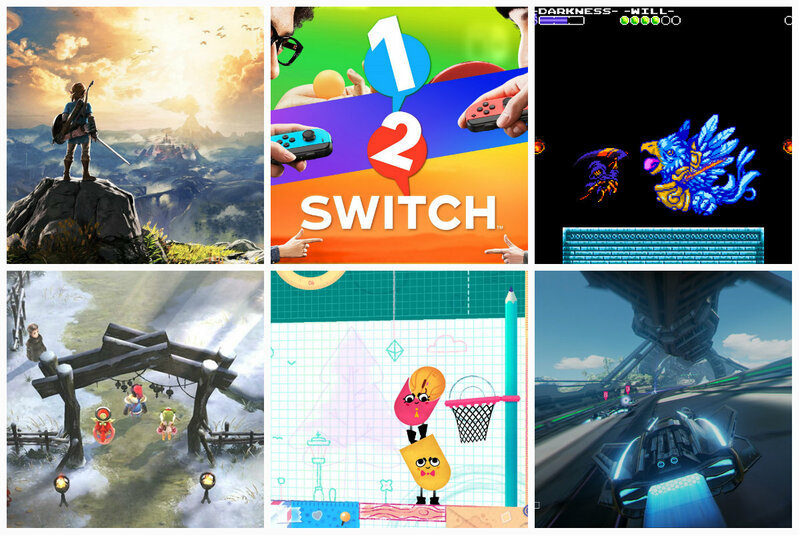 The Nintendo Switch is finally here, and if you're planning to get one then you'll need some games to go with it. Nothing comes packaged-in with the Switch unfortunately, but there are a few titles coming out the same day as the system. Of course you all know about a couple of headliners for the hybrid device, but there are some other cool releases for it that you may want to consider grabbing as well. Here are all of the games that will be available with the launch of the Switch, either physically or digitally through the eShop. Breath of the Wild is, obviously, the heavy hitter for the Switch. The fantastic looking new entry in the legendary franchise is shaping up to be quite the bombshell according to reviews, and god knows fans have done their share of waiting for this one. An open world, a gorgeous art style, a sense of wonder and mystery that we haven't seen in ages, what's not to be excited about? If you're grabbing a Switch this early, then buying this with it is a given. 1-2-Switch is the party game that Nintendo hopes will start a whole new craze. Wii Sports was one hell of a hit for the Wii back when it launched, but it had the benefit of being packaged-in with its system. 1-2-Switch will have to work a bit harder to earn its love, but it plans on doing so by offering a robust collection of wacky mini-games for you and your friends to challenge each other to. From sword fights to dice games, there's a lot to try your hand at with this one. Old Bomberman himself is back, and he's brought some friends along with him. This revival of a classic series was definitely one of the more surprising titles to be announced for the Switch. With local multiplayer, a colorful story, and some pretty slick boxart, this could be one to keep an eye out for, assuming the attached price-tag of $50 doesn't scare you off. Snipperclips is a co-op puzzle game with a pretty adorable art style. It has you and a friend cutting each other into different shapes to solve a variety of puzzles. You may have to work together to fit in a specific pattern, or you may need to cut each other into platforms or something that can hold various objects. Co-op puzzle games aren't terribly common, and this one looks perfect for trying out with a significant other or your kid. Shovel Knight was pretty much an instant classic when it launched in 2014. It had a gorgeous 8-bit style, fantastically crafted gameplay, a phenomenal soundtrack, and so many elements that were reminiscent of other great games from the past. When its first DLC released, Plague of Shadows, developer Yacht Club Games showed they weren't going to be slouches with the extra content either. Not only will the Switch be getting Shovel Knight: Treasure Trove — the collection of the game and all it's current and upcoming DLC — it'll be the first system to get their newest adventure, Specter of Torment. This is definitely one to grab if you still haven't jumped on board the Shovel Knight train yet. Fast RMX is the sequel to the much talked about indie racing title Fast Racing Neo. The F-Zero inspired racer has you speeding through gorgeous tracks with crazy looking cars and not giving a damn about petty concepts like gravity. It'll be over a month before Mario Kart 8 Deluxe releases, so why wait when you could be getting your racing fix in right away? I Am Setsuna is an exceptional throwback title to a time when JRPGs were less about flair and more about story and characters. Heavily inspired by classics like Chrono Trigger, I Am Setsuna's goal was to create a title that felt like a classic game made with today's knowledge, and for the most part they certainly succeeded. You might get tired of seeing snow everywhere you go, and the progression system could use a little work, but it has a charm to it that few JRPGs manage these days. It's a lovely mix of old and new, and if you haven't tried it yet then the Switch seems like a good place to fix that. Indie developer Tomorrow Corporation knows how to make some unique games, and three of them will be available for the Switch right at launch. World of Goo was the first and has you using balls of goo to form a structure to reach across different levels. Little Inferno is probably the weirdest of the three, and it has you mail ordering a variety of crazy things to throw into your fireplace, watching them burn in different, crazy ways. Finally, Human Resource Machine is a puzzle game that will have you starting a new job in a mail room that requires using some basic programming to get everything shipped. Skylanders: Imaginators is the next big installment in the popular toys-to-life franchise, but this time with a bit of a twist. Typically you'd just plug in your little toys of these crazy characters to play as them, but Imaginators lets you create your own as well. This one has been out for a few months now on other systems, but it's one more you can grab for your Switch. It's a Just Dance game guys. You know the drill. You hold the thing and do some dancing to the music. Do you like to dance? Because your friends don't dance and if they don't dance then they ain't no friends of mine. That's it folks, every confirmed launch title for the Switch. If you're planning on getting one then there are definitely a few here worth grabbing with it. Even if you don't count the prestigious Breath of the Wild, I Am Setsuna and Shovel Knight are both great games worth trying if you haven't jumped on them yet, and Fast RMX looks like it could be a pretty rad racer.